Two wonderfully stylish women on my blog roll, just so happen to be mother and daughter. They are the delightful Ariane and Izzy, both residing in Quebec, Canada. Each could be the posterchild for wild, colorful street style. Not only do they each have a personal style blog, Izzy and Ariane have recently collaborated to start a Montreal street style website. 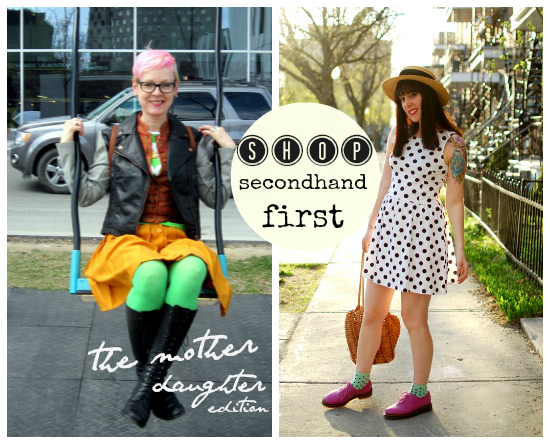 Collectively, Izzy and Ariane are avid thrift shoppers, which makes them the shoo-in selection for a Mother's Day weekend SHOP SECONDHAND FIRST showcase. Meet mother, daughter, AND major style babes, Ariane of Style Sud'est, and Izzy of YeYe Style. THE CITIZEN: Ariane, how much influence does your daughter have on the way you dress now? ARIANE: She inspires me all the time! I love how she mixes patterns and colors. Plus Awesome. Two Generations of Style. One Happy Family. THE CITIZEN: Izzy, how much influence did your mom have on your style? Were you embarrassed of your mom's dressing when you were growing up? How do you feel about her way of dress now? IZZY: My mom influenced me at a very young age, I remember as a child my mom would take me to thrift stores, I remember it the most when I was in my early teens we would go to Salvation Army on Friday nights, with my grand-ma and try on all kinds of clothing. It was heaps of fun. I was never embarrassed by my mom's way of dress; she always wore something different. Nowadays, she wears a lot more vintage: she got that from me! I love the way she dresses now, it's fun and she doesn't take her self too seriously. THE CITIZEN: Izzy is a fashion designer- did she show signs of this talent as a child? ARIANE: Izzy loved clothes at a very young age but it's probably Mom's fault, I used to buy a lot of clothes for her! I loved to dress her up in a different outfit every day, and Izzy started pattern mixing very early on. THE CITIZEN: You are both fashion bloggers, who started first and what triggered the blogging? ARIANE: Izzy was the first to blog. I started doing it because I thought it'd be great to show how what she wore or styled could be appropriate for women over 40. THE CITIZEN: Give me three words to describe the other person's style. THE CITIZEN: You both recently join forces and started a street style blog. So far, what's been the best thing about doing this project together? 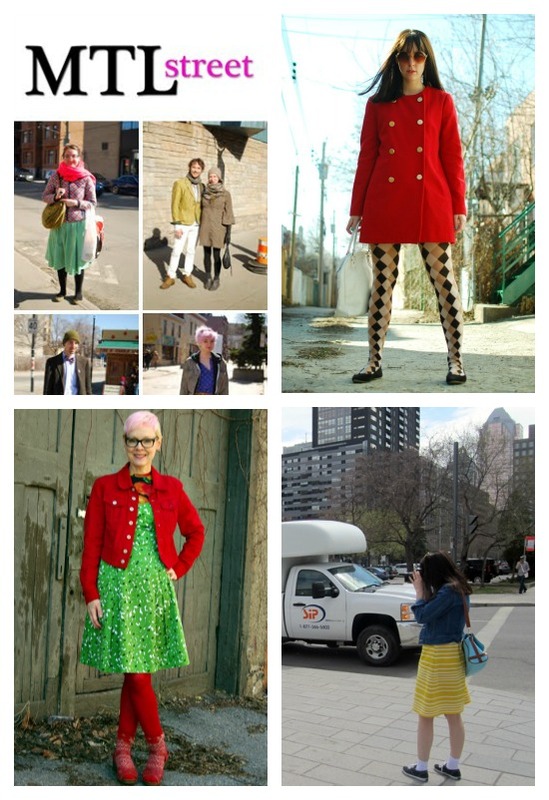 ARIANE: We love doing Montreal Street Style! Izzy and I make a great team- I'm not shy, so I approach the people, and ask if we can take their picture. Izzy is better with the camera, at least that's what she says. And of course, being a loving, supportive mother, I agree, hahahahaha! IZZY: We work as a team; so far the responses have been positive almost every time. Mom is pretty outgoing, and I'm quick with my camera which makes for some awesome pictures. THE CITIZEN: What's your style motto? IZZY: Have fun, be visible. 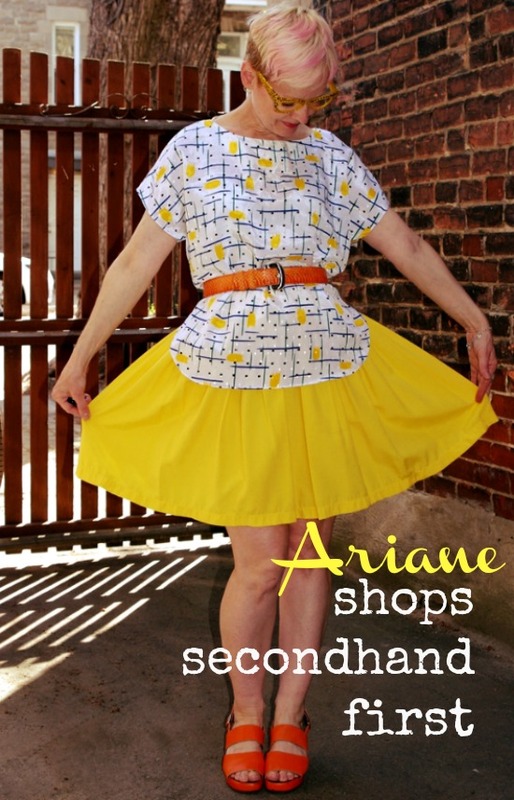 ARIANE: Wear what you feel good in. Ariane is a +40 fashion blogger from Quebec. You can check out her blog HERE. She's recently joined the Etsy bandwagon with her colorful, curated vintage favorites. Charmingly called My Cat Loves Vintage, her new Etsy shop promises to be a great success! Izzy is a Quebec-based fashion designer. Her blog chronicles her life and style. Izzy's hand-sewn designs and vintage picks can seen in her Etsy shop as well. 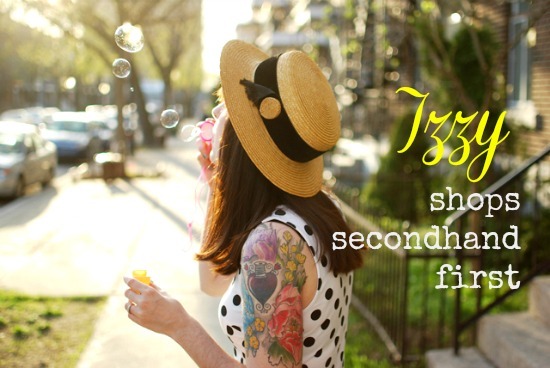 If you know someone, something or someplace that you'd like to see featured in SECONDHAND FIRST, drop me a line and share it! Be sure to put "Secondhand First" in the subject line, and email me HERE. Great interview Bella! I think they are both very inspirational women!!!! they are a gorgeous pair!!! i love how they admire each other...so sweet :). Such a great pair ! Love the interview! Great post interview and lovely photos. So nice to see that mothers and daughters can influence each other in clothing choices and blogging. Inspirational. They are so,so cute...whenever I go to Ariane's blog...I smile! Awesome interview! And I agree that they are both talented and creative and gorgeous women. I love looking in on their blogs. This is an incredibly inspiring duo. Each has a sure, strong sense of style. I'm thrilled with their new joint street style blog and I am certain that we will be seeing more about these two in the media in the days to come. Thanks for this interview, Bella. What an inspiring mother and daughter they are, such a positive creative vibe from both their gorgeous photos and that lovely interview. WOW! These two are pretty amazing. Very inspiring to see a mom and daughter that are fashion bloggers. They are just too cute for words. I love it! Ariane and Izzy wear bold colours with abandon, and I love their fearless style. Thanks for featuring them on your blog; they deserve the attention. Shoe Shine is Next Wednesday!